Read.Play.Win! is a program designed to increase literacy among young people. 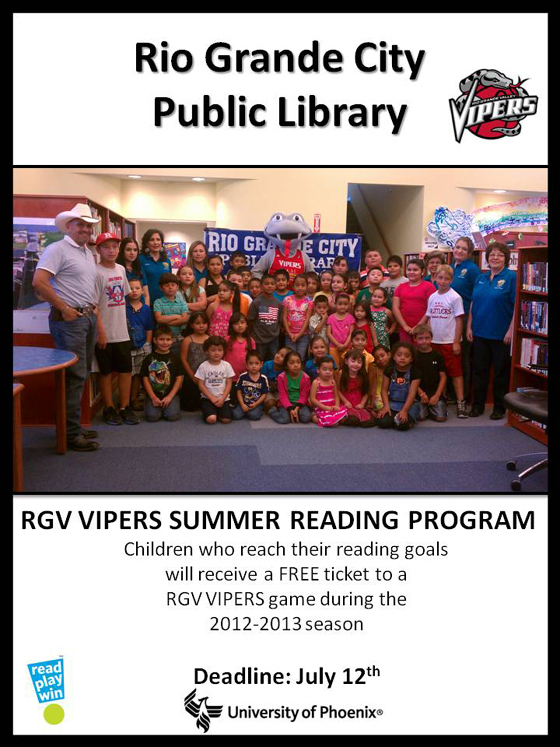 RGC Public Library is teaming up with Rio Grande Valley Vipers and University of Phoenix to motivate students to read, and in turn open up their minds to new worlds of opportunities. Studies show that students who spend more time reading achieve higher grades. Register at Rio Grande City Public Library for Read.Play.Win program ends July 12! Participants will be eligible to receive one free ticket to a Rio Grande Valley Vipers game. Literacy matters to our overall mental, physical and financial health. If you read to a child — or listen while a child reads to you — you have the power to help him or her become a skilled reader. Read.Play.Win! because everyone wins when we help kids read.